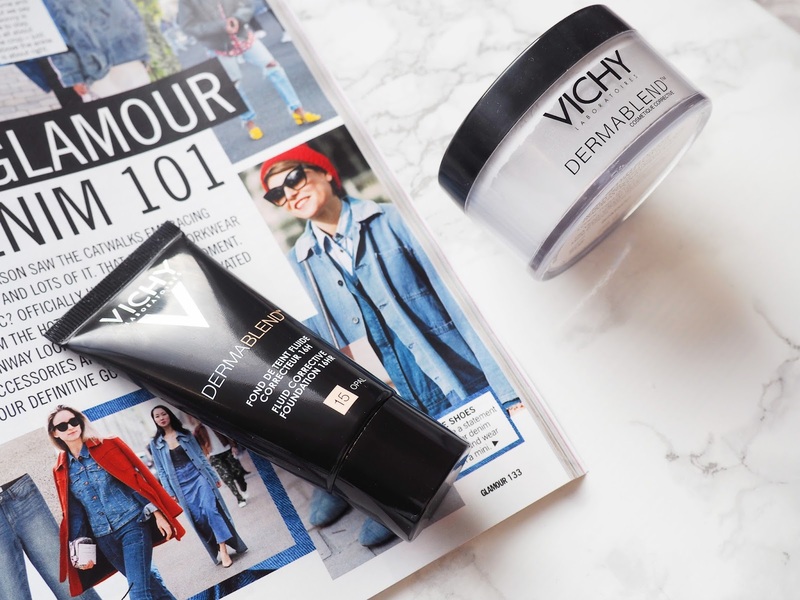 Vichy Dermablend Corrective Foundation and Setting Powder: Corrective Enough For My Skin? If you love trying out new foundations, you have come to the right place. I've reviewed 3 different ones in the past few weeks and I'm about to do another! As you know, I'm a foundation addict and a collection of various bottles (even though I've only got one face) is the result of this addiction. 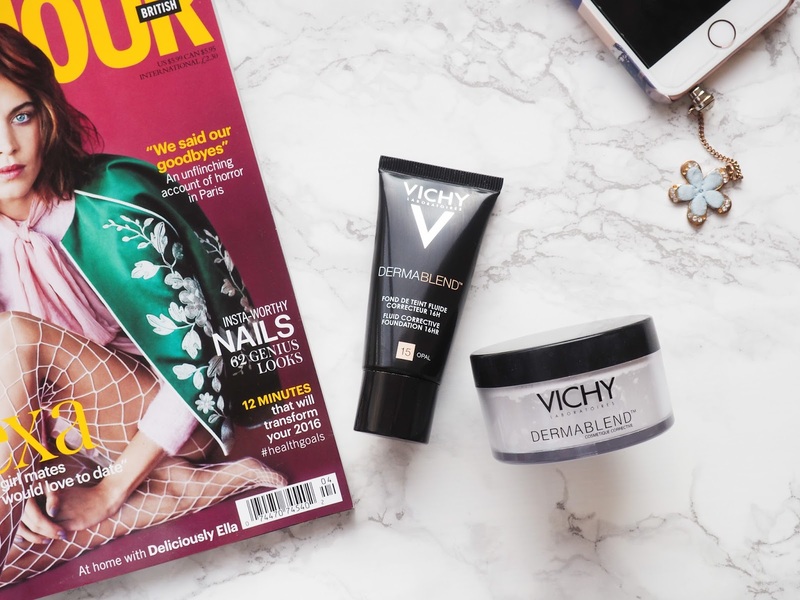 When the lovely people at Vichy got in touch asking me to try their Dermablend range, I thought to myself, do I really need any more foundation? After reading a few reviews on the products offered, I knew I had to try them because they sounded like everything I want in a foundation and powder. The Vichy Dermablend Corrective Foundation* (£18) aims to give total coverage and long lasting wear with a blendable moisturising texture. It contains a high coated pigment concentration which offers twice the coverage of a traditional foundation with a natural lightweight finish, and I can really vouch for that. 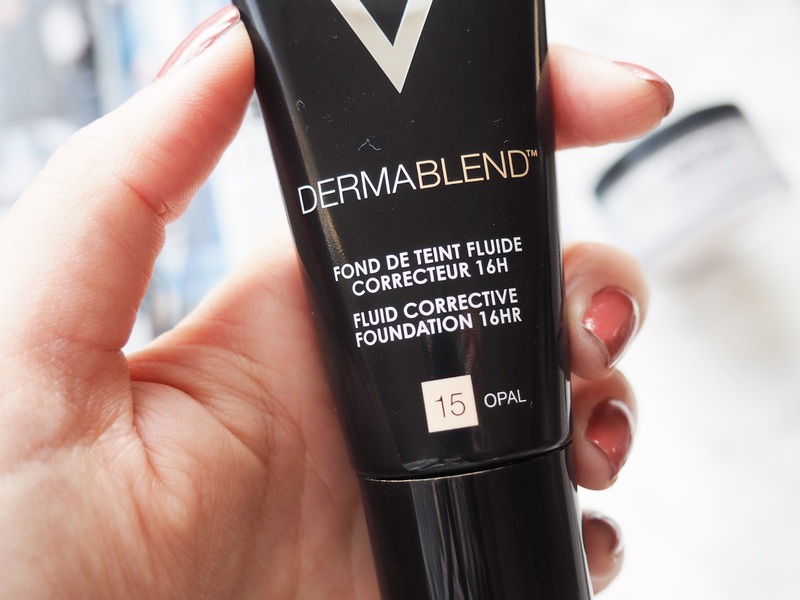 At first I thought the foundation was thick as it came out of the tube, and that it would be a nightmare to blend but how wrong was I. This stuff blends easily into my skin, and despite being heavy duty in order to conceal all skin irregularities, the foundation does not leave fine lines or cakiness. I'm left with a complexion that is even and natural looking, and the SPF35 is like the cherry on top, especially for the summer months ahead! In terms of lasting power, I kid you not; after 10 hours this looks as good as when I first apply it in the morning, and I have combination/oily skin y’all! When used alongside the range’s setting powder, I can maximise wear for a few hours and I can totally see why they are match made in heaven because when I use a different powder, the result is a lot different! Which brings me to the Vichy Dermablend Setting Powder* (15), one I thought I was going to absolutely hate but I'm so happy I don’t. I'm clumsy as can be and the thought of loose powder (or loose anything really) terrifies me. I'm not going to lie and tell you this isn't messy, it is but it’s so good that I don’t even mind. As I said, when applied over the foundation, it reinforces the hold of the base without looking too unnatural or cakey and being translucent, it doesn't change the colour of the foundation which is always a plus. Similar to its buddy, this contains SPF30 so I honestly cannot think of a better option for summer. As you can see, I've been proved wrong and yes I definitely needed these in my life! They strongly agree with my skin type and I've been wearing this combo non-stop ever since I received them. If you haven’t yet tried them and are looking for full coverage, long lasting power, yet a natural finish definitely give these a chance. And good news, both are currently on sale at Boots (here and here). Tell me beauties, have you tried this before? Let me know what your thoughts on these are below! Wishing you all a happy weekend and thanks for reading! These products look great and I agree, perfect for summer!! Sound good. I'm not one for trying many foundations when I've found the one that works for me, but this is a good review. I love how full coverage these are but I found they didn't control my oils as much as I would want. Resenha maravilhosa amei a dica dos produtos, bom final de semana. Sounds exactly like what I was looking for. I know this brand and she have an amazing quality! Lovely review! These products look great and I agree, perfect for summer. This sounds amazing! Im constantly trying out new foundations looking for that 'perfect' one! I may have to try this one out! Both sound great, Pam! I was initially worried that this might look cakey due to full coverage but have seen it actually leaves a very nice, natural finish on the skin. Definitely in my list to try. Vichy is always a must have brand, now i want to try this one. I love both of these so much! They are so amazing and I adore the coverage! Please check out my latest post, I need everyone's help! These foundation and loose powder sound amazing. Love these two as well! I agree the powder is messy but it is lovely and lightweight so I don't mind either! Great information! Have a great Saturday and be sure to check us out. Hi, dear Pam, back from dizziness (due to jet lag, no, not sick, just sleepy and dizzy, better now!) and glad to read your posts again! A friend told me that this foundation was (is) good, but I simply didn't believe, I don't know why, without even trying it. Now I am eager to buy it, since your review was so positive! And yes, loose powder is a mess, sometimes! But I am glad that you liked this one, so guess what, now I also want the 2 products! Hope you have a nice weekend! I love the fact that it had spf30 which is great for summer. I always wanted to try Vichy products... maybe now is the time! I loved your review! I absolutely love the sound of this: full coverage, long lasting as well as moisturising - what more could you ask for! I think we have the same taste in foundation, so I need this in my life lol. I also love that both the foundation and powder has such high SPFs. I have to try iy out, Pam, after your review I'm totally curious aboit it! I've had really good experiences with this range, so I'm super glad to hear it's working well for you too! Thanks for the super review.